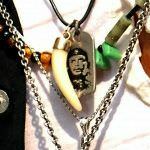 This necklace is of Che Guevara, who was an Argentine-born revolutionary. 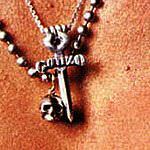 Johnny began wearing this necklace about the time he filmed the movie La Mancha. With the Che necklace is a tiger tooth necklace he added in the last years.It is rumored that he obtained it from a thrift store. 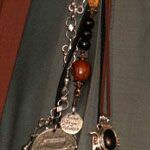 The Gonzo necklace is of course in honor of Hunter Thompson – Johnny’s wonderful and close friend who has since passed. Johnny also wears many Gonzo clothing pieces. The cross is a symbol of eternal life and immortalism. 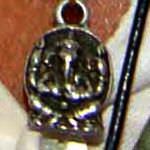 Johnny wears a necklace of the Hindu diety Lord Ganesh who is the elephant headed god of success. Of course, many wonder of Johnny’s personal beliefs, but he shares the views of many religions so this is not a statement about his religion. These rings were made by Cest Magnifique Located at 120 Mac Dougal St. NYC, NY 10012 phone number is 212-475-1613. Johnny, Iggy and Jim all went there together to get the one ring. He has a ring of a Cherokee head that was a gift from Vanessa for his 40 th birthday to honor his ancestry. 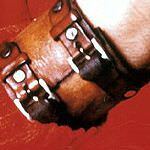 The leather cuff he wears he has worn since the days of Platoon. Some think it is from 21 jump street but he had it before that time. Johnny wears a bracelet of colorful beaded hearts that was made for him by his daughter Lily Rose. She made this when she was very young the chain of hearts is said to represent something personal between them. 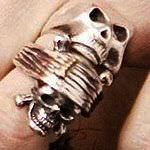 He has a new skull Jack Sparrow ring that he has been wearing the past six months or so. It is made of silver and has beautiful detail including jacks scarf and piece of eight. He received it as a gift from the set of AWE. 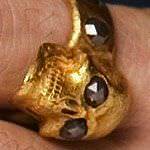 He wears a gold ring that is a replica of the one that Jack Sparrow wears in Pirates, it is actually a replica of a ring from the seventeenth century of Rome. The actual ring was borrowed from an aquiatene for use in the second Pirates and mysteriously came up missing from the movie set during the middle of filming. 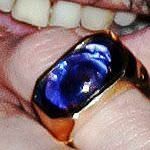 The ring he wears in the movie is sometimes the original and sometimes the gold replica. 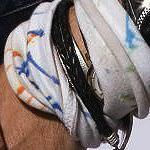 He wears a scarf at times which some think is a regular decorated scarf but in actuality has colorful writing on it in marker. The scarf is a piece of this shirt he wore 2006 in the Bahamas. The shirts were two made one from Lily-Rose and one from Jack, they said Papa on them with decoration. Wo don’t know which one the piece is of. 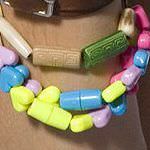 Johnny wears Captain Jacks beads on his belt loop many times. 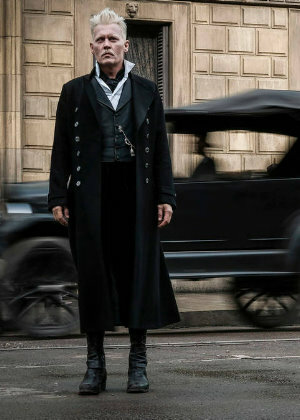 They have become a permanent addition to Johnny’s wardrobe.